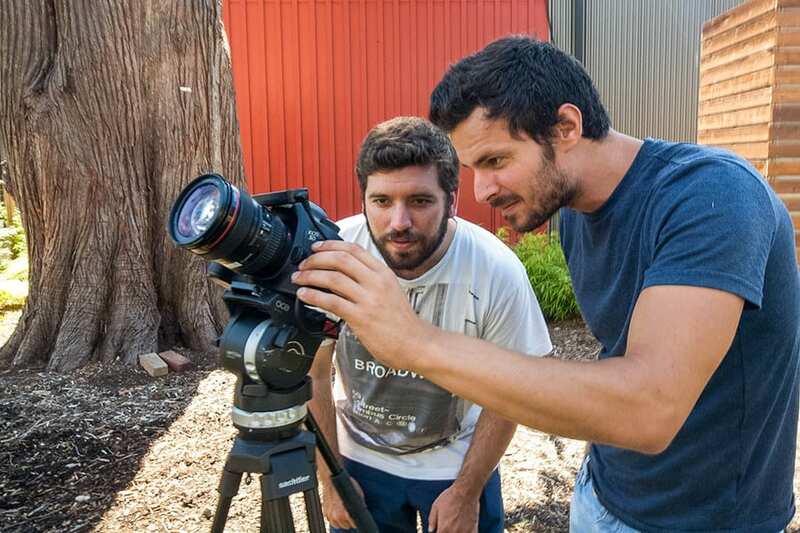 A film crew from the French production house TV Only visited Grow Community last week, shooting a half-hour feature for the magazine show Écho-Logis. The program features the best examples of sustainable architecture and construction around the globe – so naturally they found their way to Bainbridge Island and Grow. “We were looking for the greenest places in the U.S.,” says Anthony Da Silva, TV Only journaliste, who admits that while he and the producers had scouted out Grow Community online and were confident it would make a good subject, they were still startled by what they found. 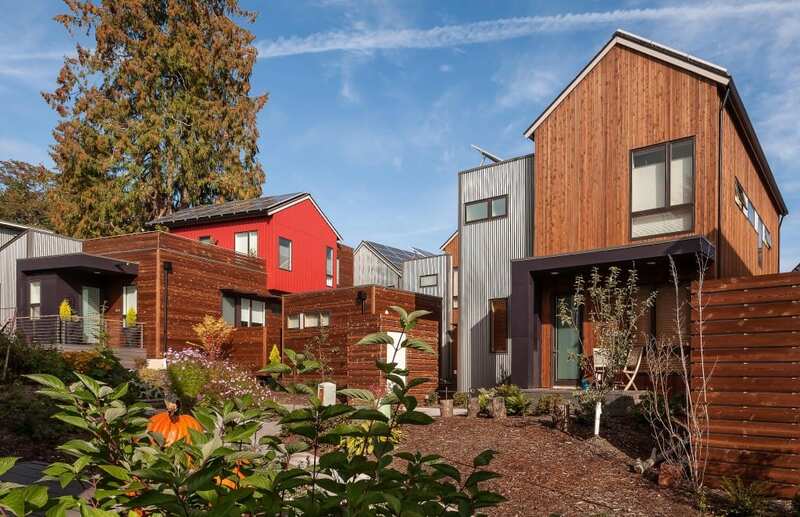 “When we arrived, we were really surprised that it was much more beautiful than the pictures we saw on the web,” Da Silva says, praising Grow for building not just eco-friendly homes but also a whole simpler, low-impact lifestyle. The four-man production team spent four days on the island after filming an eco-friendly home in Los Angeles the previous week. Da Silva interviewed Jonathan Davis, architect of Grow Community’s phase one, the Village, along with project manager Greg Lotakis and various residents. Interviews were conducted inside homes and around the Grow Community grounds and shared P-patch gardens. A drone-mounted camera buzzed around the neighborhood throughout, zooming down pathways before soaring skyward for dramatic aerial shots of Grow’s solar energy-producing rooftops. After returning to France, the team will decamp for Romania and their next feature: a woodland lodge replete with solar power and a system for recycling water. Now in its fourth season, the Écho-Logis program can be seen on France’s TV5Monde network, available in more than 200 countries. The Grow Community feature is expected to run late this year as part of the current 40-episode run. Previous Écho-Logis episodes can be viewed online here. 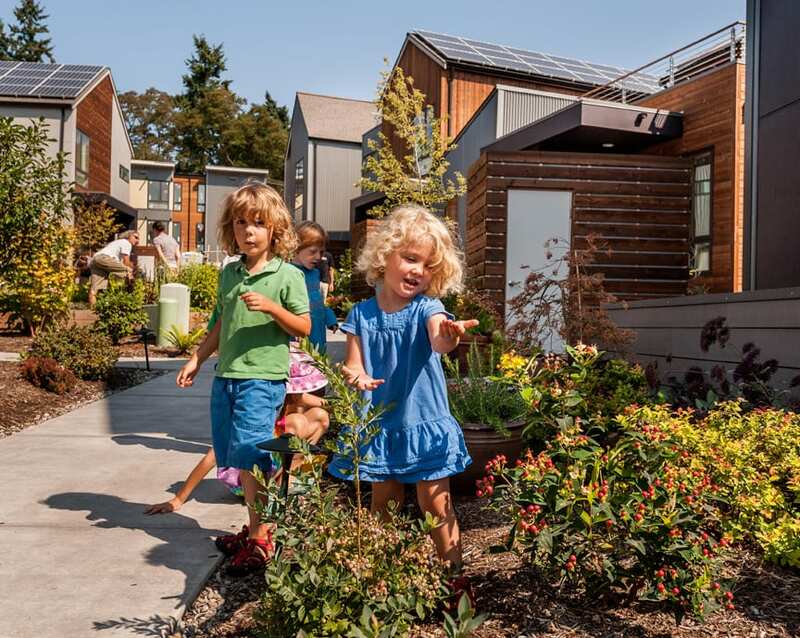 Public engagement, eco-friendly designs, affordable options, and diversity of home styles and offerings are hallmarks of the New Urbanism, the most significant planning movement of recent times. Grow Community is a paragon of this forward-thinking ethos, Professional Builder magazine says in its new issue. In the article “The Seaside Effect” (a nod to the first New Urbanist community, Seaside, built in Florida in 1980), Pro Builder fetes Grow for such enlightened features as shared pea-patch gardens, energy-efficient construction and rooftop solar power. Proximity to Winslow town center – just a 5-minute walk from the heart of the neighborhood – allowed project designers and now residents to move beyond the demands of an automobile-centric lifestyle, toward healthier and more sustainable alternatives. “We didn’t need to provide anything other than a residential fabric,” Jonathan Davis, Grow’s phase 1 architect, tells the magazine. 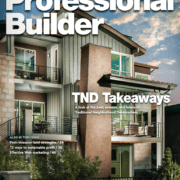 Read more about how Grow Community measures up to New Urbanist principles in Professional Builder’s July 2015 edition here – see pages 30-35. 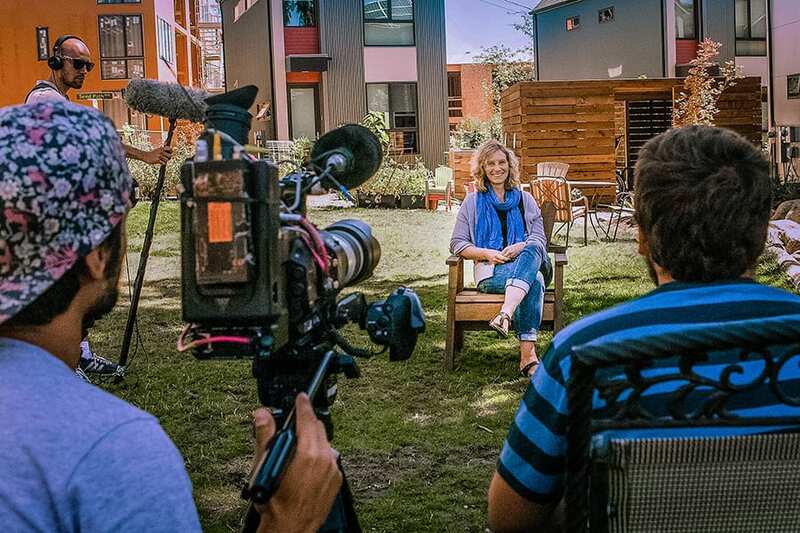 Grow Community will be featured on HouseSmarts, the “reality show for real homeowners,” Aug. 1 on KONG-TV in the Seattle area. The HouseSmarts crew and contractor/host Lou Manfredini (NBC’s Today Show, WGN Radio) visited Grow for a day this past spring and really liked what they saw. 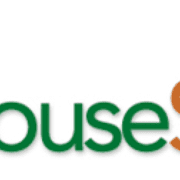 HouseSmarts’ Grow Community segment airs at 10 a.m. Aug. 1. For information see www.housesmartstv.com, and you can find the KONG-TV programming guide here. We don’t inherit the earth from our ancestors, the Native American proverb goes, we borrow it from our children. The wellbeing of our planet and the quality of life that we’ll leave to future generations is what Grow Community is all about. Every facet of our design, planning and construction asks a simple question: How can we build a healthier, more sustainable community? The success of our first neighborhood, the Village, says we’re finding the right answers. Now, as work progresses on our next two phases, the Grove and the Park, word is really getting around. Over this past year, we were honored to present the community at the Northwest Eco-Building Guild Green Building Slam event. The Urban Land Institute made Grow a prominent waypoint on its roadmap to healthy neighborhoods, the excellent “Building Healthy Places Toolkit.” And we were featured in the new eco-focused publication Conscious Company. As we reached 100 percent solar participation among our single-family homes in the Village, Solar Builder magazine named Grow one of the nation’s top residential solar installations, and we were named 2014 Home of the Year by Green Builder Magazine. Perhaps the best accolade of all came from the National Association of Home Builders, who gave Grow its very highest honors – the prestigious Platinum Award and Best In Green Award in the 2014 Best In American Living contest. We think we’re really on to something – a new model for healthy, sustainable urban living, one that offers the template for new neighborhoods and multi-generational living around the country and the globe. We’re thinking ahead, and we’re thinking big. 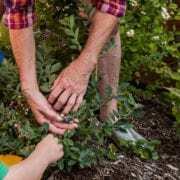 At Grow Community, we know we borrow the earth from our children – and we want to return it to them, with interest. From all of us at Grow Community, Happy Earth Day! The Urban Land Institute has drawn up its roadmap for healthy development, and Grow Community is a prominent waypoint. Grow is cited twice in the “Building Health Places Toolkit: Strategies for Enhancing Health in the Built Environment,” an expansive new report on sustainable planning and construction from the ULI. 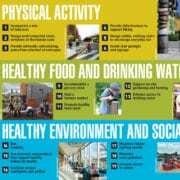 The report looks at developments and communities that have been successful in promoting physical activity, healthy food and clean drinking water, and general social well-being. Grow’s famous community gardens and “edible landscaping” are cited as a prime amenity in today’s urban and suburban planning. 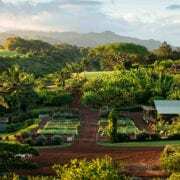 Grow is also touted for earning certification under the One Planet Living program, whose ambitious 10-point goals promote reducing humans’ impact on the earth. You can read all about Grow’s impressive One Planet designation elsewhere on our website. “Reading a report” might not sound like the most scintillating springtime activity, but the ULI’s new “Building Healthy Places Toolkit” will surprise you – we promise. It’s a very colorful read, and highlights the most forward-thinking work being done in planning and construction today. View the report here (page 48 online & 40 in print) and find out more about the sustainable vision that earned Grow Community recognition among the very best new neighborhoods anywhere. 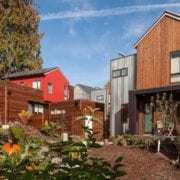 Conscious Company Magazine, a new journal focusing on innovation and sustainability, recently paid a call on Grow Community to get the scoop on our über-intentional neighborhood. MK: Do you feel this idea can scale and be brought to other communities in the U.S.? GL: We truly hope so. There are so many great builders and innovators in green building that now it’s time to be thinking large-scale. Too many neighborhoods have been developed for one particular moment in our lives, lack energy efficiency, or allow vehicles to disconnect us from one another. You can read the whole interview with Greg Lotakis here. Thanks to Maren Keeley and the new Conscious Company Magazine for the fantastic coverage. Grow Community got some more great kudos this week in Urban Land, the online magazine of the prestigious Urban Land Institute. 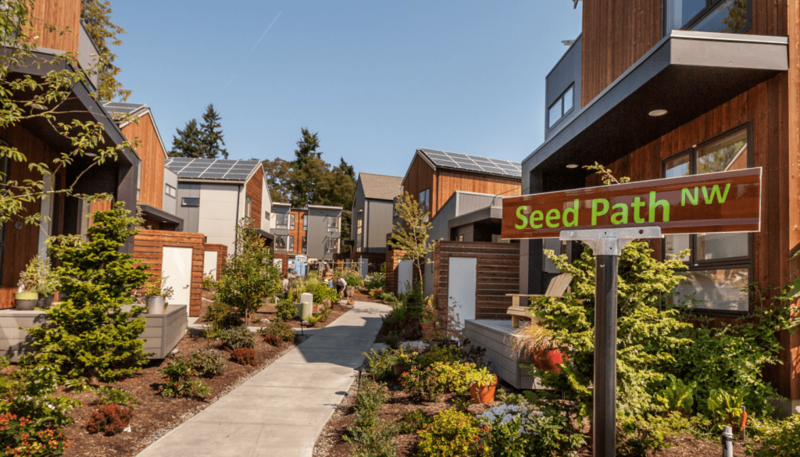 Grow is honored in the feature article “Growing Sociability: Integrating Communal Spaces with Development,” which looks at “agrihoods” (development-supported agriculture), edible landscaping, and other trends in sustainable community design. “A new day is dawning in residential development that can serve as a foundation for how people will be living for generations to come,” ULI writes, a comment amplified by a leading architect and town planner. Community, the planner says, is the next generation’s golf course – an attractive amenity to build a whole neighborhood around — and developments that include a working farm or agricultural activities are creating new healthy, cohesive communities. Sounds like Grow! Our project manager Greg Lotakis tells ULI how Grow Community’s shared gardens are the axis around which our first phase, the Village, is organized. And what a draw those gardens are for buyers. It’s a great article on this exciting trend in urban planning, all the better for highlighting the success of our own Grow Community. Read the whole story here. Grow Community is outstanding in its field — more precisely, its planter boxes. 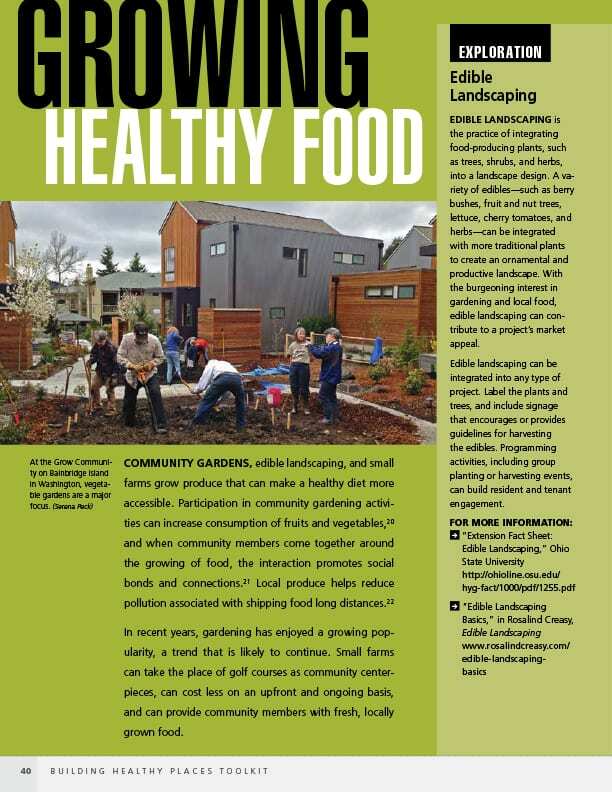 Grow is one of 10 exemplars of the new Urban Agriculture, the Urban Land Institute Magazine says in its current issue. 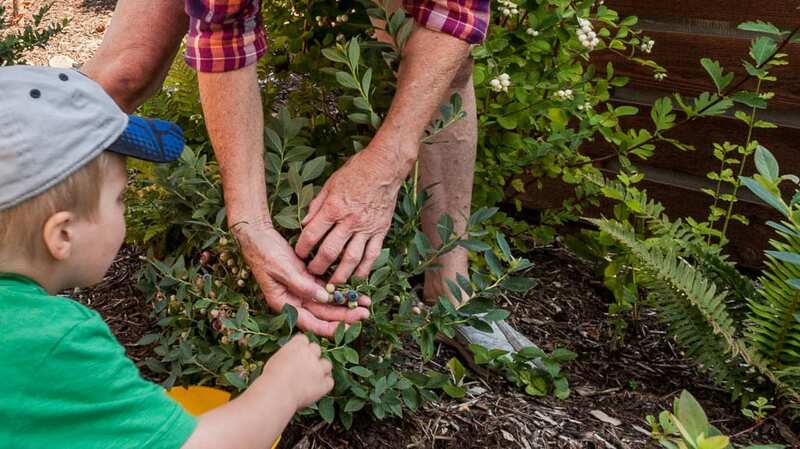 The ULI praises Grow for the rich mix of raised beds and plantings throughout the community grounds, tended by residents and yielding a bounty of fruits, vegetables and herbs to be shared by all. It’s a sustainable strategy, the magazine writes, narrowing the wasteful distance between farm and table and enhancing food security. It’s an idea that’s catching on — and one that puts Grow Community in the forefront of a national movement. Other projects feted by the ULI include the Grow Dat Youth Farm in New Orleans, La. ; sprawling and productive rooftop gardens on Chicago’s McCormick Place convention center; and other amazing plots and pea-patches that have sprouted up in unlikely urban settings in Toronto, London, Montreal, Los Angeles and other major metropolitan areas. Great company for Grow! Thanks to the Urban Land Institute for calling attention to Grow Community’s commitment to healthy, sustainable urban agriculture. 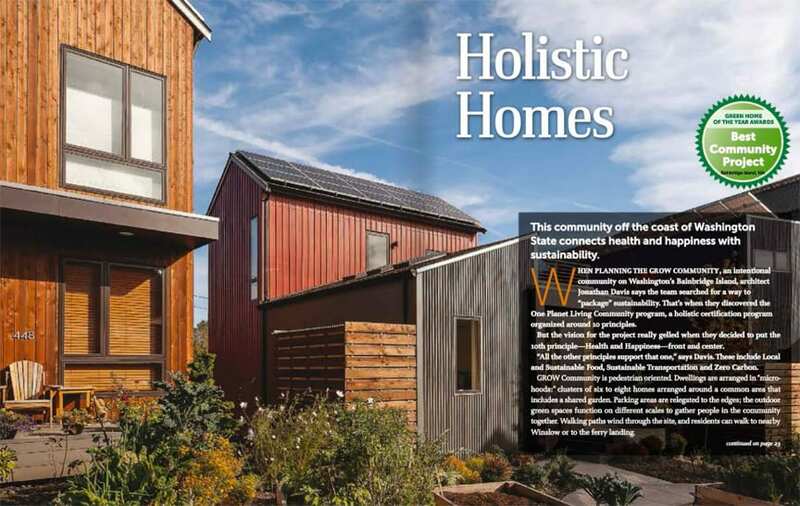 Grow Community has been honored with a coveted “Green Home of the Year Award” in the “Best Community Project” category for 2014 by Green Builder magazine. 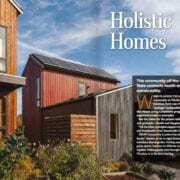 In a feature headlined “Holistic Homes,” the magazine praises Grow for “connect[ing] health and happiness with sustainability” through every element of design and construction. 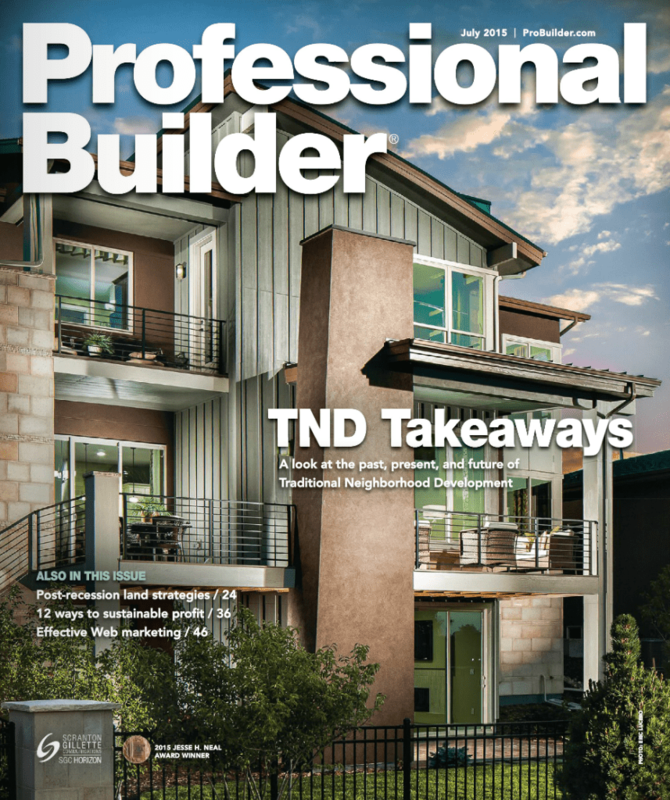 The magazine highlights Grow’s advanced framing techniques, weather-tight building envelopes, and locally sourced solar products among other distinguishing features. 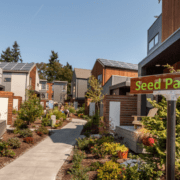 Grow is already the largest planned solar community in Washington state, with a solar component also planned for the next two phases, the Grove and the Park. An expert panel of judges considered nearly 40 projects on criteria including overall sustainability, resilience, affordability, synergy with the environment and surrounding neighborhood, and depth of building science employed. “Our winners combine the best of tradition and technology — homes of great beauty that are also resilient and flexible,” the editors write to introduce the awards. 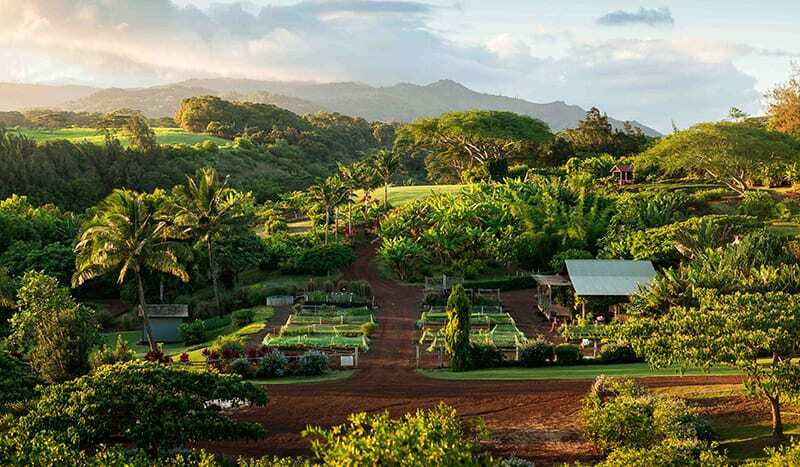 Jonathan Davis, architect for Grow’s first phase, the Village, tells Green Builder that all the principles of One Planet Living on which the Village was designed supported the goals of health and happiness. “When my kids go out the door, I know they’re safe,” says Davis, now a resident of the Village. Read this great feature on the Green Building website page 22.